before the Exam date. Download the RBSE Rajasthan 10th class examination dates from the official website http://www.rajeduboard.rajasthan.gov.in/. Students interested for these Rajasthan 10th Board Exams have to visit the official website regularly for latest Updates. 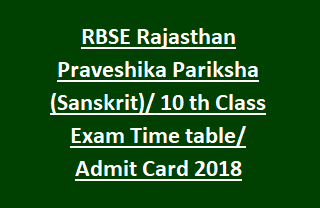 Rajasthan Secondary Education Board RBSE Praveshika Pariksha Sanskrit 10th class Exam time sheets will be announced in the month of January-2018. Rajasthan Education Board will be placed Final examination dates/ admit cards/ Exam time table in the RBSE official website. Students of 10th class have to plan for this examination from now onwards. Go through the official website for regular updates. Rajasthan 10th Exam Results will be announced in the month of May-2018. Detailed instructions to download the admit cards, time table and other details are given below. Every Year BSER Rajasthan 10th Exams will be held in the month of March/ April 2018. Students have to revise the previous year model papers. Download the RBSE 10th Class Exam Admit card from the website. Candidates have to carry the Admit card to enter in to the Examination Hall. -English (2): 08/03/2018 (Thursday- 8.30 to Rs. 11.45 AM). - Maths (9): 13-03-2018 (Wednesday- 8.30 to Rs. 11.45 AM). - 3rd Language- Sanskrit (71), Urdu (72), Sindhi (74), Gujarathi (73), Punjab (75): 15-03-2018 (Thursday- 8.30 to Rs. 11.45 AM). -Social Studies (8): 17-03-2018 (Saturday- 8.30 to Rs. 11.45 AM). - Science (7): 20-03-2018 (Tuesday- 8.30 to Rs. 11.45 AM). Students of 10th class have to visit the official website of RBSE http://www.rajeduboard.rajasthan.gov.in/. Click on the RBSE 10th Exam Time link Enter in to the Time Table section. Download the examination dates, time and other details of RBSE 10th class Examination time table 2018.